October 7 was a very bright and colorful day for trainees at Ethiopian Aviation Academy, Africa`s largest aviation training facility. 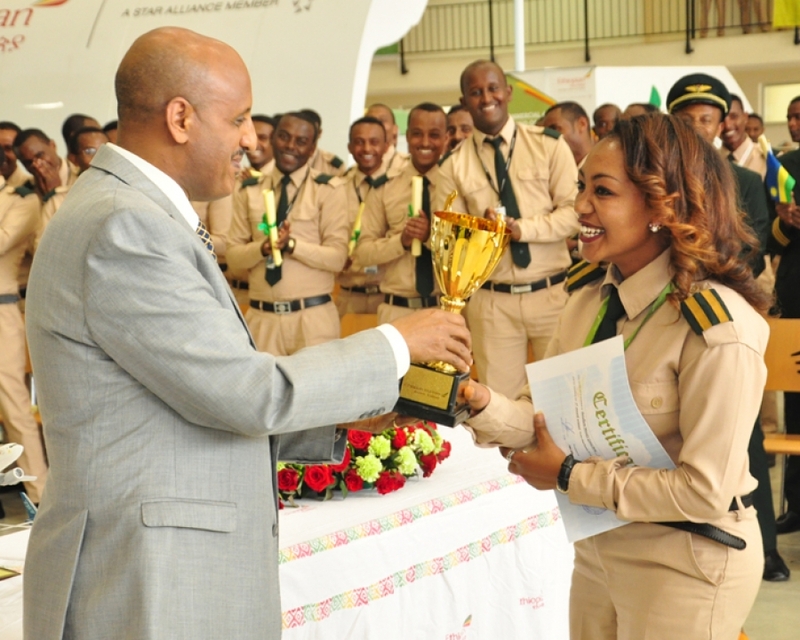 The giant academy which belongs to Ethiopian Airlines successfully graduated 262 aviation professionals. A total of 120 cabin crew, 50 pilots, 66 aviation maintenance technicians and 26 Equipment and Facility Maintenance technicians (16 majoring in Industrial Electricity and 10 in Industrial Mechanics) were capped. Ethiopian Airlines is one of the very few gems in the industry that trains the largest number of aviation personnel in Africa. They train around 2000 aviation professionals every year and they envisage enhancing their intake capacity to even 4,000 by 2025. The training standards are great and they typically combine classroom instruction, simulators and on-the-job training before flight crews work their first flights. Trainees are thoroughly trained to meet certification requirements in safety-related topics like firefighting, first-aid training, aviation law, survival at sea and security. Their Cabin Crew training program in particular measures up to standards like those of Singapore Airlines` 15-week basic training program, Emirates` 8-week “ab initio” training and Alaska Airlines` 5-week program. We wish the new graduates a very successful aviation career ahead of them. However, with the difficulties associated with securing employment in the airline industry constantly frustrating the dynamics in the aviation landscape, many skilled aviators have switched industries and are settled elsewhere. We hope that the new graduates will quickly find employment that closely matches with their qualifications. They must up their strategy for job applications and gain every advantage possible. A specialist aviation platform like yadley.com can help them overcome these difficulties and give them access to a predefined pot of exciting aviation opportunities.